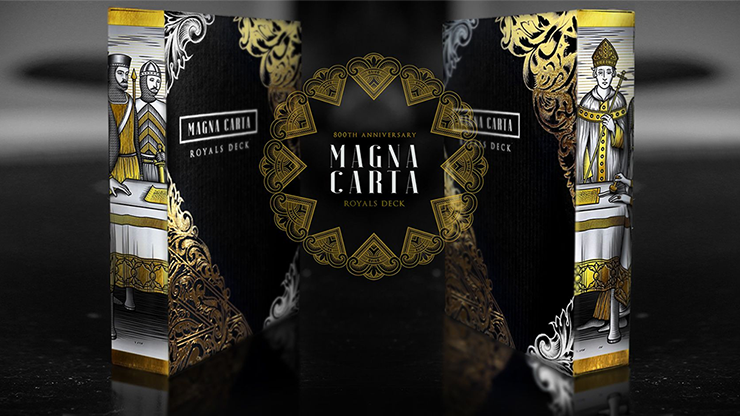 Today, when you order "Magna Carta Royals Edition Deck by Alexander Chin", you'll instantly be emailed a Penguin Magic gift certificate. You can spend it on anything you like at Penguin, just like cash. Just complete your order as normal, and within seconds you'll get an email with your gift certificate. This year the Magna Carta turned 800 years old. Initially ambiguous in its future, this document has transformed over time into an icon that has rippled throughout world history with positive change. The Magna Carta is one of the most inspiring examples of timelessness. Today the Magna Carta is the foundation of liberty and human rights in many parts of the world. 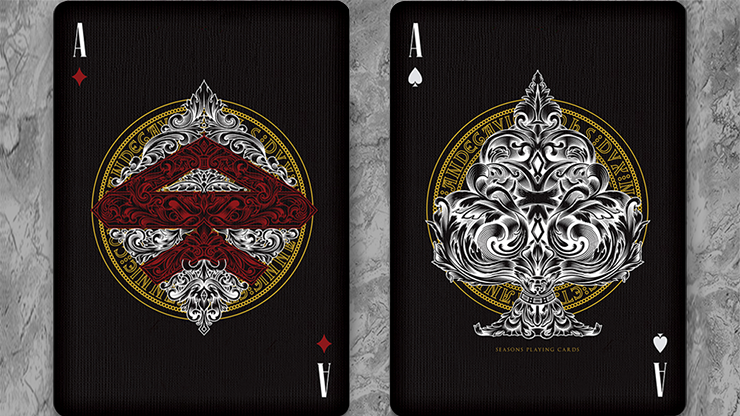 This deck series was created to honor and celebrate this landmark occasion. 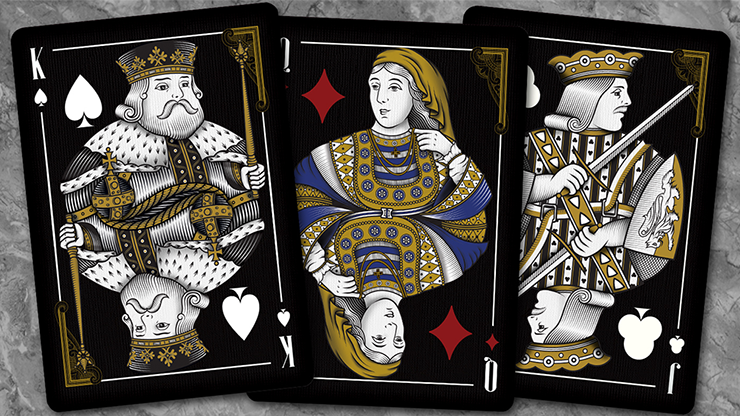 The Royals deck commands attention in rich black, representing the King and his empire. The sleek back design features the gorgeous crowned lion in which 3 heads represent the 3 lion crest of the Angevin Empire. The court cards were carefully selected based on actual people involved around the Magna Carta. The suits were used to help show the family factions within this time period. 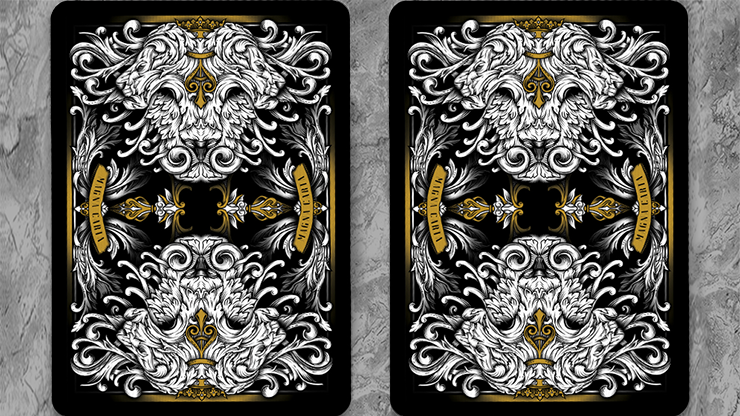 All of these cards were inspired by existing illustrations of the people that could be found from that time and translated into elegant designs. Each suit carries symbolism based on the court cards that they hold. The Spade features a cross in the center representing the cross on King John's coat. The Club hides a lion face representing the Angevin Empire. A sword skewers the Heart, adorning the fleur de lis for Louis VIII. Finally the Diamond proudly displays the crest symbol of Robert Fitzwalter, the leader of the baronial opposition. 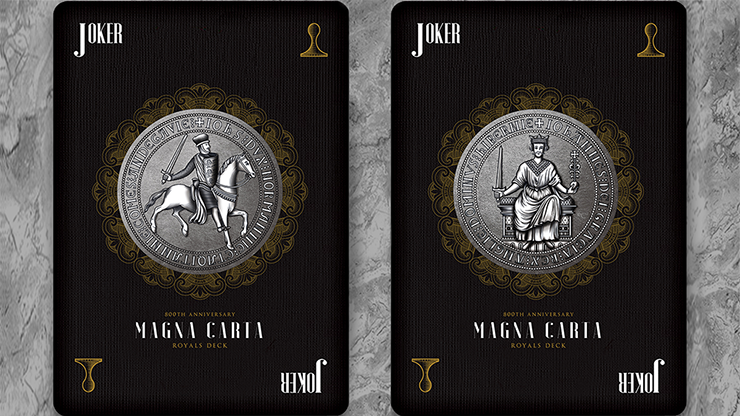 The Jokers feature an authentic recreation of the face and back of King John's seal. These tuck cases feature a realm of modern elegance that compliments the older illustrations in a beautiful juxtaposition. The designer packaging features a peek of each suit on the front and back of the case. Tuck cases are foiled with eye-catching gold and embossed on premium stock to provide a sense of depth to the touch. Inner tuck case is lined with an exact replica of the actual 1215 Magna Carta document in archive from The British Library. 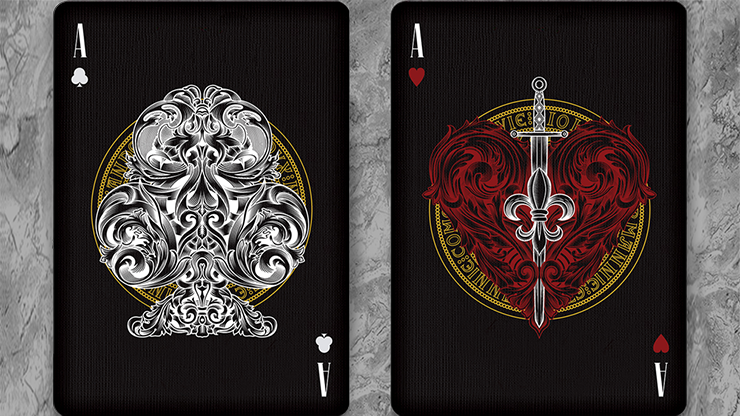 Cards are made with Aristocrat stock and coated with premium magic finish for increased longevity and performance. Card designs feature gorgeous metallic gold accents throughout that help unite the cards to their cases and to each other. Printed with the United States Playing Card Company.